Reports From The Pharm: What a way to end the week! 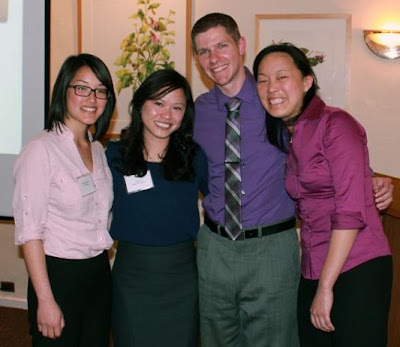 Earlier today, the UCSF team was announced as the national winner of the 13th Annual Pharmacy and Therapeutics Competition sponsored by the Academy of Managed Care Pharmacy Foundation. For more about this dynamic team and their journey to the national competition, visit UCSF's Campus Newspaper, the Synapse. The AMCP Foundation conducted the 13th Annual National Student Pharmacist P&T Committee Competition (P&T Competition) at the AMCP 25th Annual Meeting & Expo in San Diego, California, April 4-5, 2013. The competition was designed to challenge students to gain a real world perspective of the formulary management process. Following a local competition within each Chapter, the winning team from each participating Student Chapter then submitted their presentation materials to the AMCP Foundation National Competition Selection Committee. This committee selected eight (8) teams to participate in the AMCP Foundation 13th Annual National Student P&T Committee Competition (P&T Competition) in San Diego, California. Formulary management is uniquely dynamic and requires extensive and timely pharmaceutical knowledge as well as an understanding of the medical community practice standards that exist within the health care system. A Pharmacy and Therapeutics Committee (P&T Committee) is ultimately responsible for developing, managing, updating, and administering the formulary system that is utilized by managed health care systems. Pharmacists who serve on P&T Committees must know how to evaluate the best available scientific evidence, clinical and economic, weigh its use and its impact on patient population outcomes, be able to conduct cost/benefit analyses, and relate drug therapy choices to practice guidelines. Development of these necessary formulary management skills will help managed health care systems achieve the challenging goals of improving the quality of patient care while controlling scarce healthcare resources. The local and national competition is intended to give students an opportunity to hone a variety of skills including critical analysis, presentation and research skills. More importantly, the competition allows students to view different styles and processes that can be used in effective formulary management and provide exposure to, and a working knowledge of AMCP's Format for Formulary Submissions.